After writing 13 books, Lysa TerKeurst was considered an average, mid-list author whose titles typically sold around 50,000 copies. Many people doubted Lysa’s ability to reach the next level, overcome her stagnant sales, and write a breakout book. For her 14th book, Lysa hired Rob Eagar to critique her manuscript, expand her author platform, develop a memorable brand, improve her speaking skills, and build a powerful book marketing plan. As a result, Rob’s expertise helped Lysa’s next book, Made to Crave, hit the New York Times bestseller list for over 25 weeks, reach #7 on Amazon, and sell over 200,000 copies in the first nine months. Plus, the book sales generated over $1,000,000 of revenue for her publisher, Zondervan, a division of HarperCollins. 1. Critiqued and improved author’s manuscript. Rob reviewed and critiqued each chapter of Made to Crave during the initial concept and writing phases. Rob helped Lysa improve her manuscript by challenging her to deepen the teaching and provide more tangible application for the reader. 2. Helped author develop a compelling title. The author’s original book title was When a Cheez-Its and Chocolate Girl Gets Healthy, which is confusing and too long to remember. Thus, Rob walked the author through a process to develop a much stronger title that yielded the arresting phrase, Made to Crave. 3. Empowered author to capture nationwide radio awareness. During initial meetings with the author and publisher, Rob suggested creating a free resource to generate widespread buzz for the book launch. The publisher hired him to create the Made to Crave: 21-Day Challenge. Next, Rob taught the author how to offer this resource to build major partnerships. Lysa offered the 21-Day Challenge as an exclusive resource to one of her contacts at the KLOVE Radio Network. KLOVE liked the resource so much that they featured it for 3 weeks, which yielded exposure on more than 300 radio stations to over 3,000,000 daily listeners. This created huge buzz for the book on a national level. 4. Managed creation of author and book websites that attracted over 100,000 visitors. 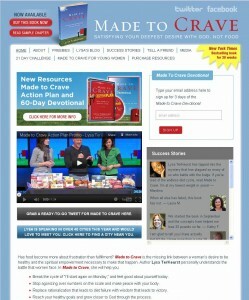 Rob managed the creation over both the author’s personal website (www.LysaTerKeurst.com) and the book website (www.MadeToCrave.org). His involvement insured that critical marketing elements were included, such as word-of-mouth tools, free resources, author FAQ’s, and social media connections. Rob’s expertise helped the author double her monthly blog traffic, and the book website received over 100,000 unique visitors in the first 30 days. 5. Helped author develop content for video curriculum and live webcast. Rob helped the author develop specific content for each episode of the book’s accompanying video curriculum. Plus, he coached the author through developing a format for her live Internet webcast. As a result, the curriculum sales doubled the publisher’s annual goal in the first 4 months, and the author’s webcast received over 120,000 views during a 6-week period. 6. Helped author land major speaking opportunities. Rob helped the author improve her public speaking skills, which led to interest from the E-Women national conference tour in 2010. Rob also taught the author how to double her speaking fees and negotiate keynote slots for the 2011 and 2012 nationwide E-Women conference tour. These events draw average audiences of over 3,500 people. 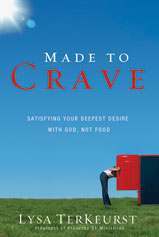 Made to Crave spent over 25 weeks on the New York Times bestseller list. Reached #7 on Amazon.com and #136 on the USA Today bestseller lists. Over 200,000 copies sold in the first nine months. Over 120,000 downloaded views of the author’s live webcast. Over 100,000 unique visitors attracted to book website in the first 30 days. Over 50,000 study guides and 20,000 video units sold in the first nine months. Over $1,000,000 of revenue generated for the publisher. 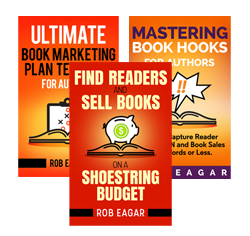 This case study is one example of how Rob Eagar helps authors and publishers sell books like wildfire. To request Rob’s assistance with your manuscript or book marketing campaign, contact him today.